The steak has an old and fascinating story, truly a legend. According to tradition the birth of this specialty is connected to the Medici family: they used to celebrate St. Lorenzo (August 10th ) offering to the population a large amount of ox meat to be roasted in the city’s squares. The great fires, the parties and the –rare- chance to eat good meat made the celebration very famous. Unfortunately there is no document stating this (and no T bone found by archeologists), and although we know that beef was served during banquets we have no evidence about how it was cooked. The Italian word for steak is ‘bistecca” and derives from the English beef steak. It seems that on one occasion a group of English merchants were in Florence and eagerly joined the banquet and started asking for “Beef steak! Beef steak!”…hence bistecca. 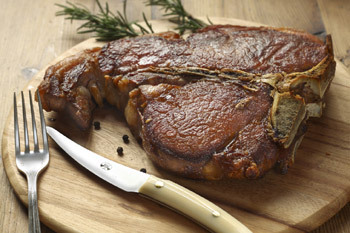 This would be the legendary version, but it is more probable that eating a T- bone steak was a habit introduced by the English travelers and residents in Tuscany, just like the “roast beef” (do not faint if you find it mentioned as rosbif in a menu). 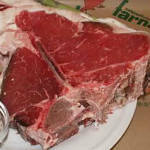 Outside of Florence the Florentine T bone steak is frequently referred to as Fiorentina. The Florentine st eak is cut from the veal loin and in Tuscany the animal has to be a chianina breed. Probably one of the oldest breeds used for heavy work already by the Romans. It was only at the end of the XIX century that Chianina was used for the production of meat. In the middle it presents its T shaped bone, with the filet on one side. It is at least 1 inch thick. The correct weight can vary from 900 to 1300 gr. It has to be aged at least a few days (for some up to 20!) and when it is time to cook it the meat has to be at room temperature. (Never put a cold steak on the grill). The grill must be hot. The fire is ready when the coals are mixed with ashes so that the meat is not burned. The heat of the fire will seal the meat quickly. Food lovers could discuss cooking times endlessly but as general advice the steak should be cooked 5 minutes on each side. Once cooked place it on a wooden cutting board before you start slicing it so the juices will redistribute. As side dishes consider simply cooked beans, baked potatoes (please no french fries) or a fresh salad. “Because outside of Tuscany they do not even know how to cut it: they cut it thin, without filet. It suffices that you look at those boneless steaks! What’s that? But for us ….it is thick, at least three fingers. And they do not know how to cook it…the steak: zac zac and done”. If you are looking for a steak while in Florence check out the list of best fiorentina by Dissapore, a foodies’blog to rely on.